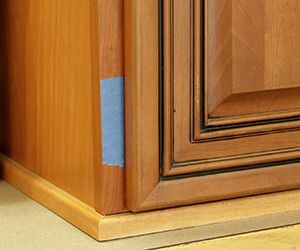 When referring to an overlay door, it means the entire door lays on top of the cabinet frame. Overlays can come in a variety of sizes but in common applications we most often see a 1/2" overlay or 1/4" overlay. Although, where European Hinges are used there is a broader range of overlay sizes. When measuring your overlay, you will need to look on the hinged side of the door, to determine your overlay size. Your door will overlap the frame by a specific dimension, below is a visual to help determine and measure your overlay. 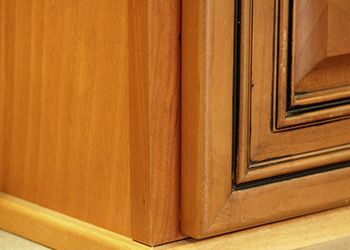 The above photo shows the entire door is on the outside of the cabinet frame. This is an overlay door. 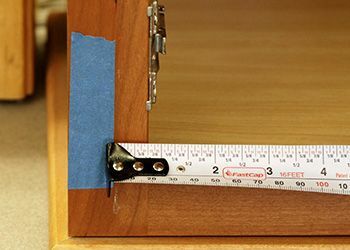 Start on the hinged side of the door and place a piece of tape along the back edge so that the edge of your tape is directly against the edge of your door. Open the door (or in this case the door has been removed) and measure from the edge of your tape mark to the cabinet opening. This specific example is a 3/4" overlay.